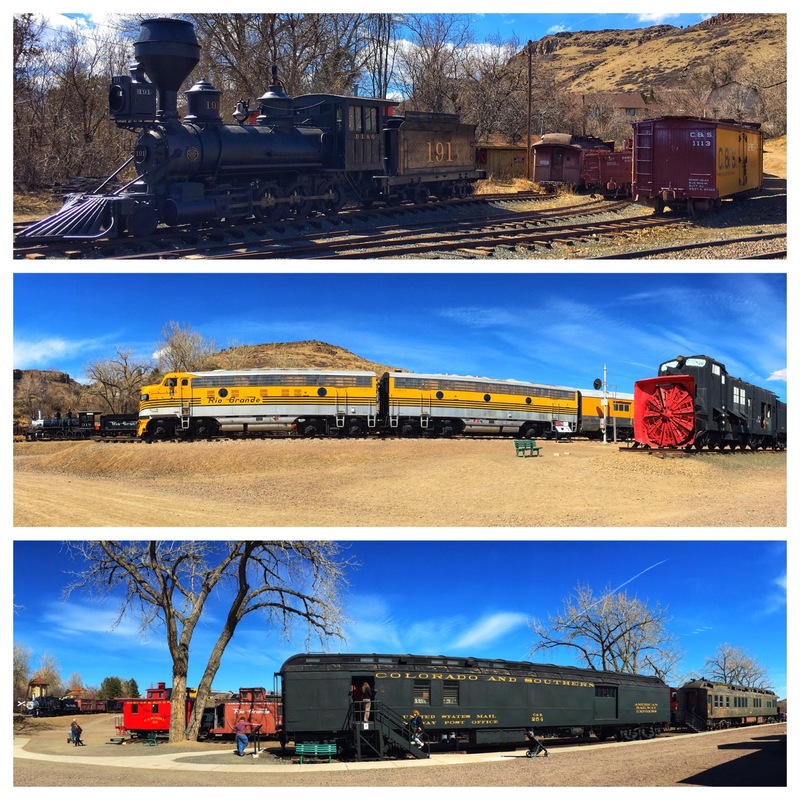 The Colorado Railroad Museum is tucked between hills in an industrial section of Golden. The place was hopping on a warm and sunny Saturday afternoon. It’s not huge or fancy, but I had a good time. The old station has a small museum in the basement with a model railroad layout. 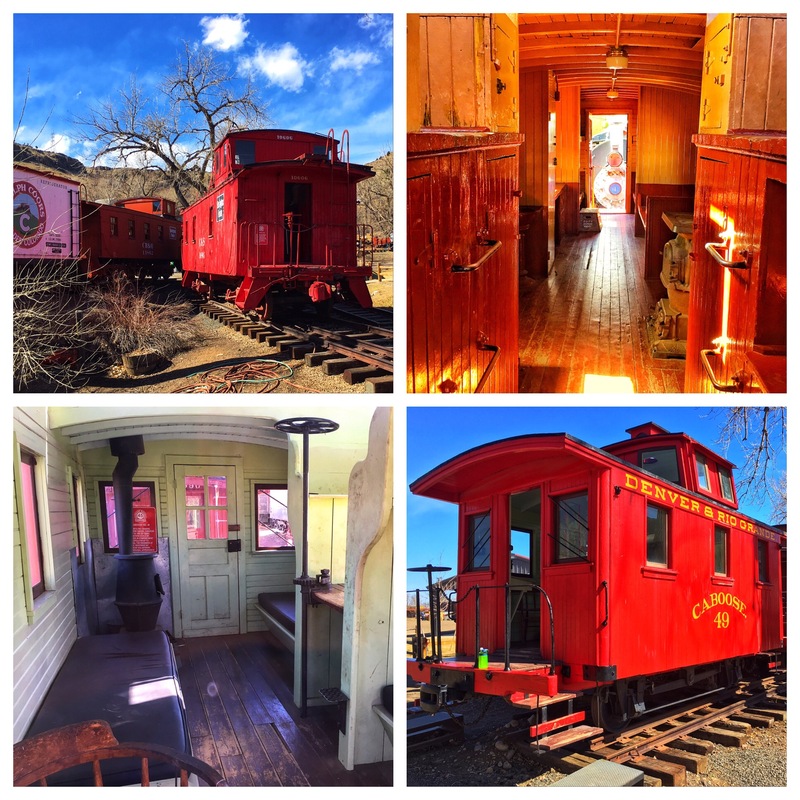 The red caboose-looking cars above are a bunkhouse (interior at lower left) and a cooking car for railroad crews. I could have had a ride on one of the “Galloping Geese” and regretted that I didn’t pay the $4 to do so. Here’s what the web site says about them. Three of the original seven Galloping Geese can be found at the Museum. 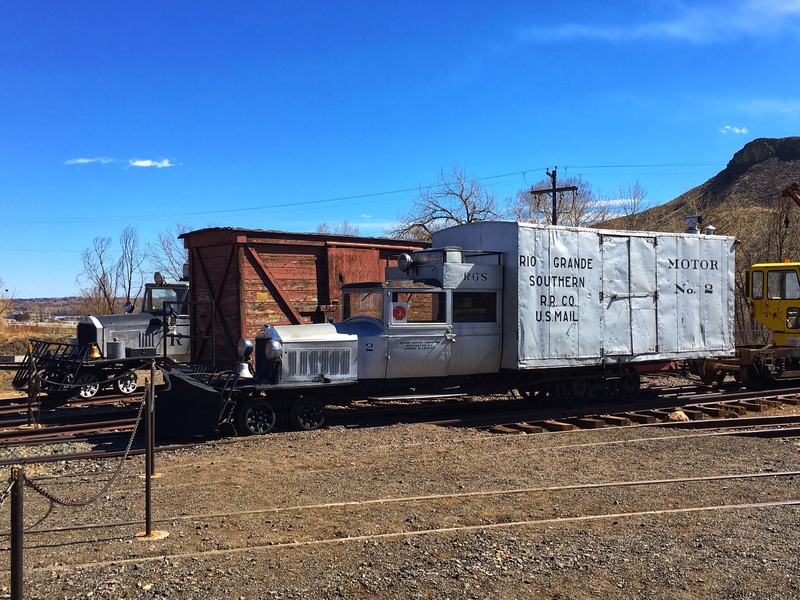 Created from a freight box mounted on an automobile frame, the “Geese” allowed RGS to continue passenger and freight service to remote parts of southwestern Colorado. 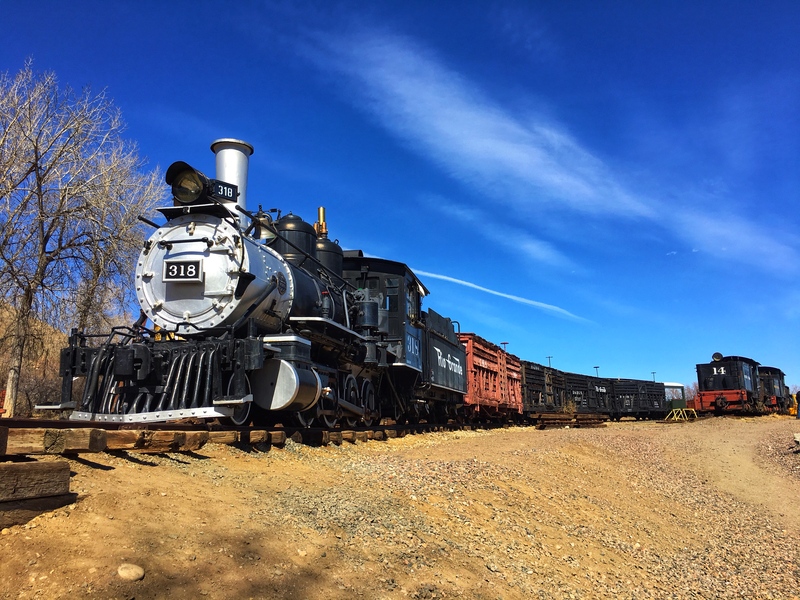 Geese were less costly to build and operate than traditional steam passenger trains. Designed to self-balance on uneven mountain track, the swaying back half of these cars look like geese waddling down the line; hence their popular name. 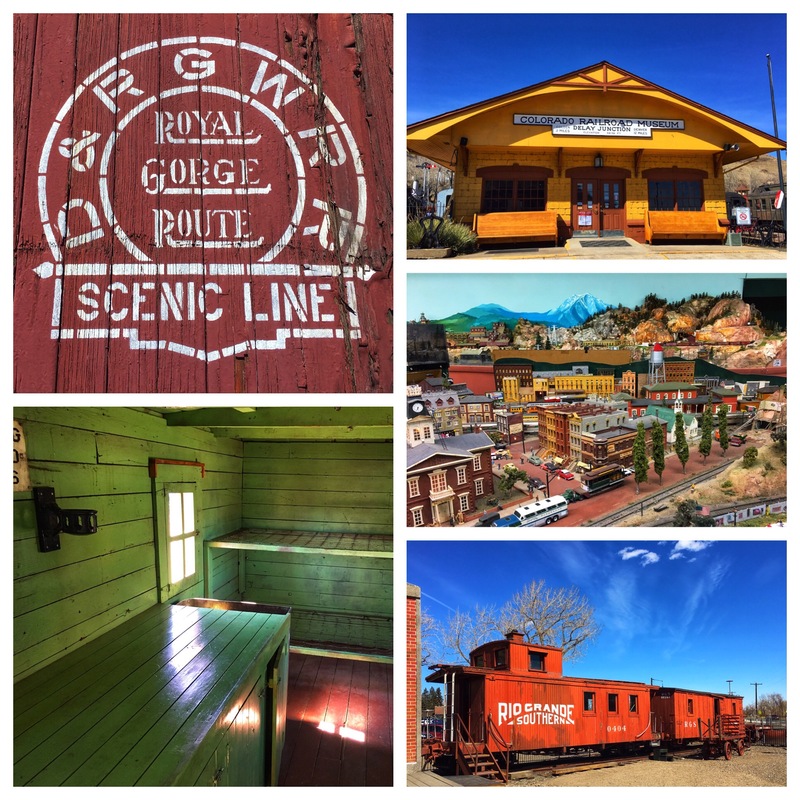 There was an outdoor model railroad garden in full swing. I was able to enter many of the cars on the property (minus two that were reserved for kids’ birthday parties). Here’s the outside and inside of two cabooses. The green car in front of the bottom picture above is a mail car. They had it set up inside to look authentic (lower right, below). 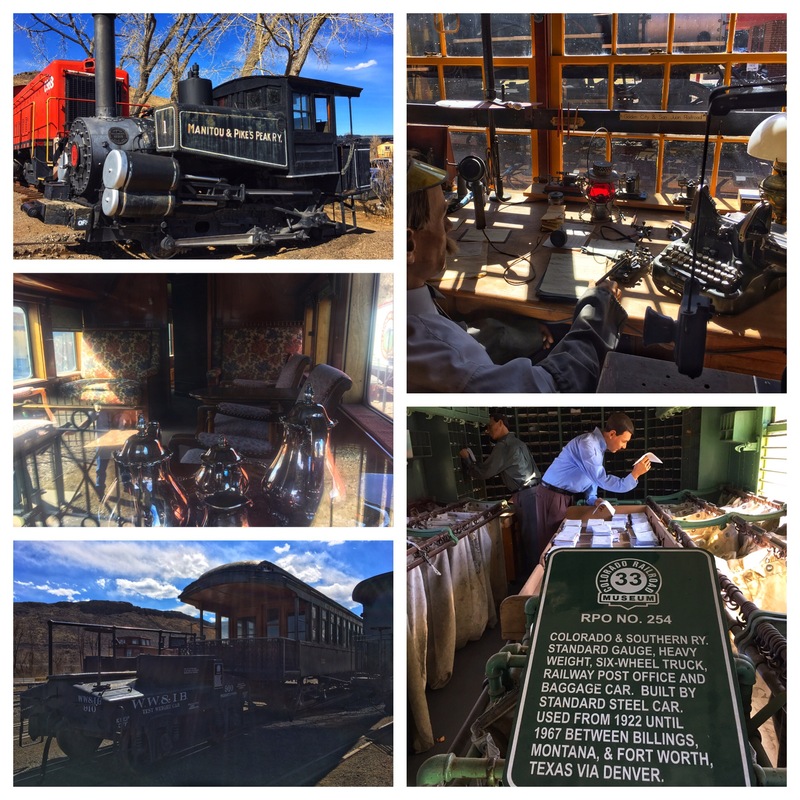 When I saw the mannequin with the paper, my immediate thought was “I can make a hat, or a broach, or a pterodactyl.” The rest of the photos (clockwise) are a test weight car used to check the accuracy of track scales; the inside of a business car, one of the old Pikes Peak Cog Railway engines; and a railway telegraph office. The turntable is authentic. It’s balanced so that two men can turn it by pushing the black and yellow handle on the left. The roundhouse is a reproduction where restoration work takes place. The museum was a bit hit or miss about signage on the outside equipment, and the grounds are a lawsuit waiting to happen. But I’m glad I went and would happily go back again sometime.